Whether the goal is baking food or making snow, all of the ingredients have to come together just right to achieve the desired final product. Unfortunately for snow lovers, last month's abundance of cold was met with a regrettable dearth of precipitation. 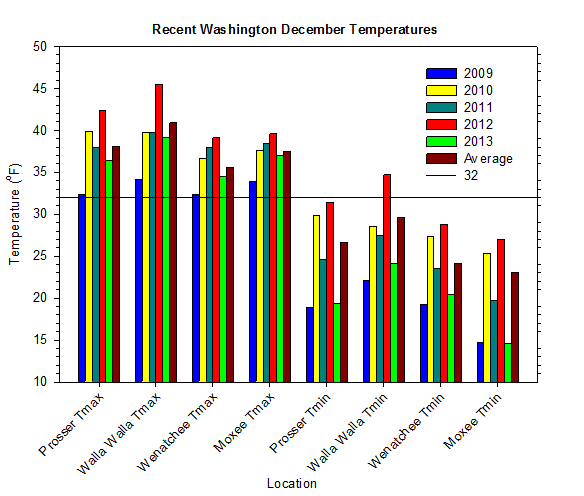 Consequently, December's weather was quite chilly, and yet dry and largely uneventful. Still, the early December arctic outbreak was impressive on its own merits, and was generally our coldest period since late November 2010. 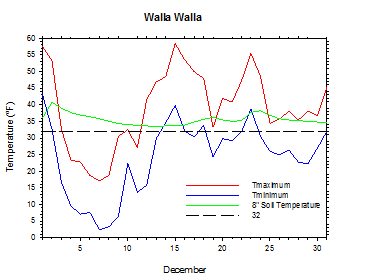 Prosser experienced sub-freezing high temperatures for 9 straight days, while Pullman recorded lows of below -5 degrees for 5 consecutive nights. While the first third of the month was dominated by dry, arctic air, the last 20 days or so featured milder and relatively inactive conditions. The latter period included the occasional passage of weak systems, but a notable absence of major storms, heavy precipitation, or strong winds. In fact, many areas were not only dry but also unusually clear in December, which is normally one of the cloudiest months of the year. During the arctic outbreak, skies were sunny for much of the time as a result of very dry air. For the rest of the month, a “dirty ridge” blocked any strong weather systems from impacting the region with thick and widespread clouds. However, the weakness of the ridge also allowed for the passage of anemic disturbances, and the associated mixing prevented any extended periods of low clouds and air stagnation. 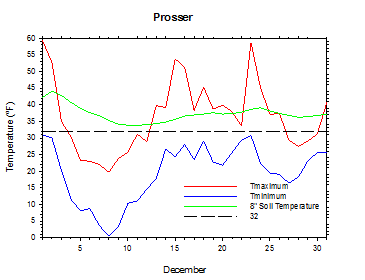 Monthly high temperatures at Prosser were only slightly below average thanks to several mild periods during the middle to latter part of the December. However, overnight temperatures were well below average due to the early arctic outbreak, as well as a lack of any mild nights for the remainder of the month. Normally, active December conditions cause increased winds and mixing, as well as persistent cloud cover and moist conditions. However, such was not the case this year. There were a sufficient number of clear and stable nights to allow for cold low temperatures, despite a fairly mild upper level air mass during mid and late December. 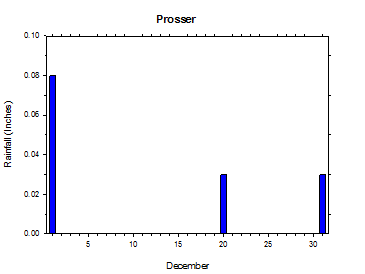 The average low temperature at Prosser was 19.4 degrees, which is 7.2 degrees below average. In fact, the last time there was a larger (positive or negative) monthly temperature anomaly (mean, high, or low) at Prosser was December of 2009, meaning that 47 months had elapsed since the occurrence of such a significant departure from normal. Overall, 2013 featured the third coldest December mean low temperature on record (1989 to present). One of the major consequences of the recent dryness is our present lack of snow, even in the mountains. Luckily, it is not too late to recover somewhat from the current dry spell if later season snowfall materializes. However, with the Cascade snowpack and snow-water equivalents generally at less than 50% of normal as of January 7th, it is certainly not too early for genuine concern, especially if recent conditions persist into early 2014. December began with a storm passage that brought wet, windy, and mild conditions to Washington. Over 6 inches of rain fell at Stevenson, and winds gusted to 50 mph. Temperatures reached the low 60s in south central Washington, but only the upper 30s in parts of north central Washington. Lows were in the upper 20s to low 30s in parts of central Washington, but only in the 40s in western areas. Cooler air began to infiltrate the Northwest on the 2nd, as light snow fell in parts of Washington. Conditions dried out quickly thereafter, and highs ranged from the 30s in the north to the 50s in the south, with lows in the 20s and 30s. On December 3rd, a brisk north to northeast wind sent dry and cold air into the region. Dew points plummeted to below zero in some areas, and afternoon temperatures failed to warm, especially in the north. Sustained northeast winds of 35 mph were recorded at St. John. Highs were in the 20s east and 40s in the west, with lows ranging from the single digits to the 30s. The morning of December 4th brought temperatures as cold as -6 degrees at Pullman, with highs only climbing into the upper teens to low 30s in eastern areas, and upper 30s in western areas. The cold snap continued for several days. On December 5th, highs were in the 30s in the west and the mid teens to mid 20s east of the Cascades, with lows in the teens above to single digits below zero in the east, and mid teens to 20s in the west. A weak system passed on December 6th, bringing clouds and winds, but little precipitation to Washington. However, a reinforcing shot of cold, dry air came into the state from the northeast. High temperatures on December 7th ranged from 8 degrees at Anatone to 33 degrees at Tokeland, as lows were below zero for certain areas east of the Cascades, and in the teens in western Washington. Frigid lows of -12 degrees at Pullman and -8 degrees at Corvallis East were registered on December 8th. The 9th was the last bitter cold morning, as the low temperature dropped to -3 degrees at Horrigan. By the afternoon, highs reached the 20s in the east and the 30s in the west. Numerous areas experienced record cold soil temperatures, which were evidence of the prolonged nature of the cold period. A few record cold air temperatures were also observed. Many areas experienced the coldest weather since 2010 or 2009. 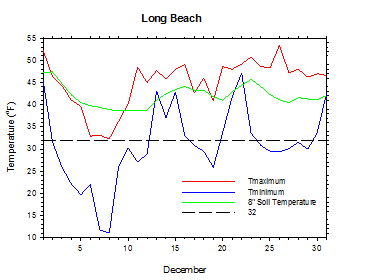 However, warmer temperatures arrived on December 10th. Due to increased mixing, areas around Ellensburg peaked in the upper 30s, while some western areas topped 40 degrees. Still, most eastern areas were stuck in the 20s to low 30s. Lows ranged from the single digits to the 20s in the east, and the 20s and 30s in western Washington. A few central areas were still in the single digits on the morning of the 11th. A weak system arrived on the 12th, and brought rain to western areas and a light mix to some eastern areas. 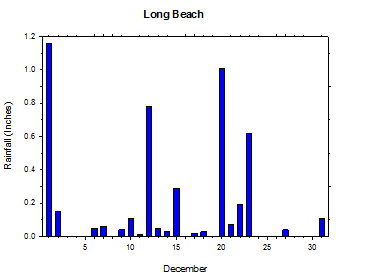 0.78 inches of rainfall occurred at Long Beach on December 12th. Highs reached the 20s and 30s in the east, and upper 30s to mid 40s in the west, after morning lows in the teens to 20s in the east, and 20s to 30s in the west. Thus began a milder period that featured rain clipping northwestern Washington, but generally dry conditions elsewhere. Significant warming continued on the 15th, as highs soared to 62 degrees at College Place, while upper 40s to 50s were common in south central Washington. Even so, parts of north central Washington remained below 40 degrees. Low temperatures ranged from the upper teens to the 40s. 0.29 inches of rain fell at Long Beach, with at least light rainfall across much of western Washington. Snow moved into the state on December 20th, with several inches accumulating in parts of western Washington before significant warming caused a rapid transition to rain. The mountains received moderate snowfall before a change to rain occurred. Parts of central Washington were also greeted with a bit of snow on the morning of the 20th, while several inches fell near the Idaho border. A series of weak to moderate strength systems moved through Washington during late December, as the dirty ridge pattern continued. Rain fell mainly in northwestern Washington on the 21st and 22nd, and then a slightly stronger storm passed on the 23rd. Strong warming occurred in south central Washington due to increased atmospheric mixing, as some locations reached 60 degrees. Rain fell across much of the state, although it was light in most areas. A drier ridge of high pressure arrived around Christmas, as conditions stabilized, and temperatures cooled in the east. Rain clipped northwestern areas again on the 27th, and then light rain affected much of Washington on December 31st. 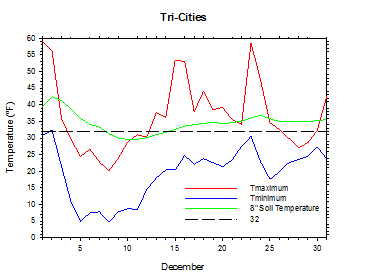 The average December temperature at Prosser (WSU IAREC) was 27.5°F, which is 4.7 degrees (1.3 standard deviations) below average. The average high temperature was 36.4°F, which is 1.7 degrees below average. The average low temperature was 19.4°F, which is 7.2 degrees (1.8 standard deviations) below average. The maximum temperature recorded last month was 59.2°F on December 1st, while the coolest daily high was 19.7°F on December 8th. Low temperatures ranged from 30.9°F on December 1st to 0.6°F on December 8th. Daily average temperatures ranged from 47.6°F on the 1st to 9.2°F on the 8th. The monthly precipitation total was 0.14 inches. 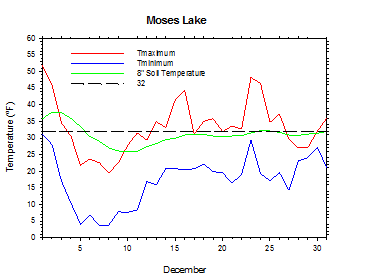 The average wind speed was 3.6 mph, and the average 8 inch soil temperature was 37.3°F. 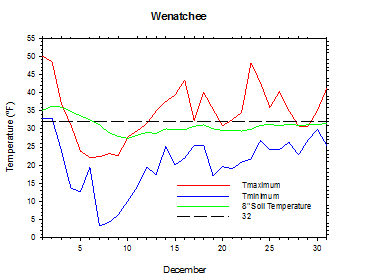 Wenatchee (WSU TFREC) recorded an average temperature of 26.6°F, which is 3.0 degrees below average, while Walla Walla's average monthly temperature of 31.2°F was 3.8 degrees below average. 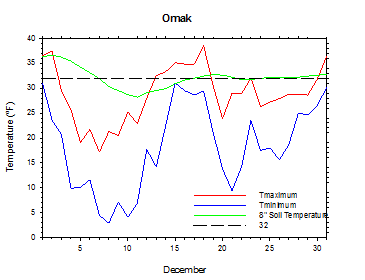 Omak was one of the cooler spots in eastern Washington, with an average December temperature of 23.6°F. In western Washington, Mt. 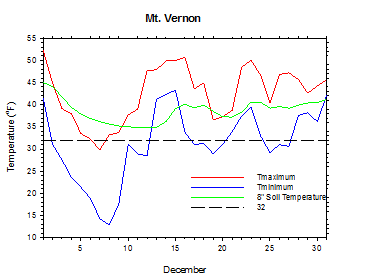 Vernon's average temperature was 37.1°F, which is 2.9 degrees below average. 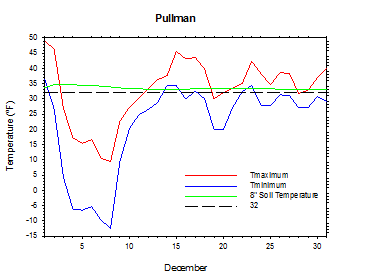 December 8th: The temperature at Pullman plummeted to -12 degrees. December 15th: The temperature at College Place soared to 62 degrees. There was some concern about potential cold damage to winter wheat due to the early December arctic outbreak and a lack of snow cover, but the impacts cannot be assessed until early spring (National Agricultural Statistics Service). 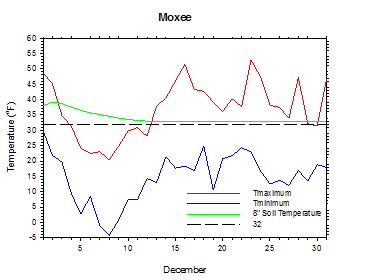 On December 29, 1990, the temperature at Moxee plunged to -14 degrees. According to the Climate Prediction Center (CPC), January temperatures and precipitation amounts should be near average. It is becoming increasingly likely that El Niño conditions will develop by the late spring or summer.